The Dell PowerEdge T130 Tower Server is the ideal server for driving productivity and collaboration for small to midzise businesses (SMBs)! 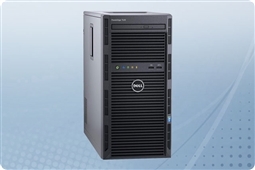 Made for high performance at a low price, Dell T130 tower servers deliver fast processing and memory speeds along with 4 bays of storage capacity. This makes the T130 tower server versatile enough to fit a variety of roles within your infrastructure such as application servers, domain controllers, file servers, and virtualization host servers. Choose from a wide range of connectivity and component options that allow you to build your perfect Dell PowerEdge T130 today. Aventis Systems offers a wide range of upgrades such as operating systems, remote access, storage, memory, and processors for you to choose from! All Aventis Systems Dell PowerEdge T130 tower servers come with a standard 1 year parts replacement warranty. Additional warranty upgrades such as Onsite, next day parts replacement, and extended term warranties are available as well where more coverage is needed. So shop our models below and build the perfect Dell PowerEdge T130 tower server today for your remote office or small business!